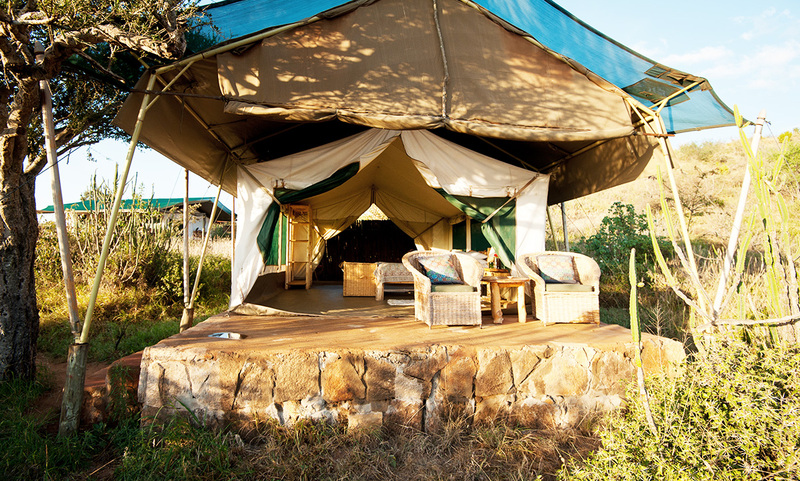 Blending into a hillside above the Ewaso Narok river, we have 6 tents with open air bathrooms allowing you to shower under the stars. 2 of these are standard rooms with either a double or two single beds. A third single can be added. We have a total of four family tents which are a double room, with interconnecting twin for smaller children. One of our family tents is extra large and designed for families with up to four children who are in an interconnecting quadrouple room, next door to the double and with a bathroom at the rear. One double tent is set further away from the other tents and has a private view of the valley down to the river. 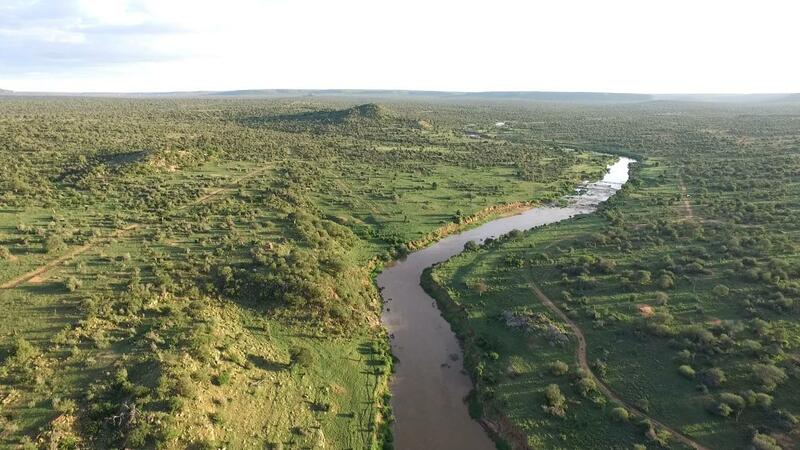 We can arrange a private dinner for honeymooners in the bush one night, and you can even have a private fly-camp set up for you for a romantic night under the stars on a raised deck overlooking the river. A small team of staff sleep nearby for safety but it is private at the same time. The Mess tent is the central area with a dining room inside, and sitting area with books and games, a display cupboard full of bones, and skulls and bits of ancient pottery found on our walks. Outside the mess there are two wooden decks overlooking the valley in front, with a seating area at one end and breakfast deck at the other end. Over the years we have been privileged to welcome guests in wheel chairs as well as elderly guests. 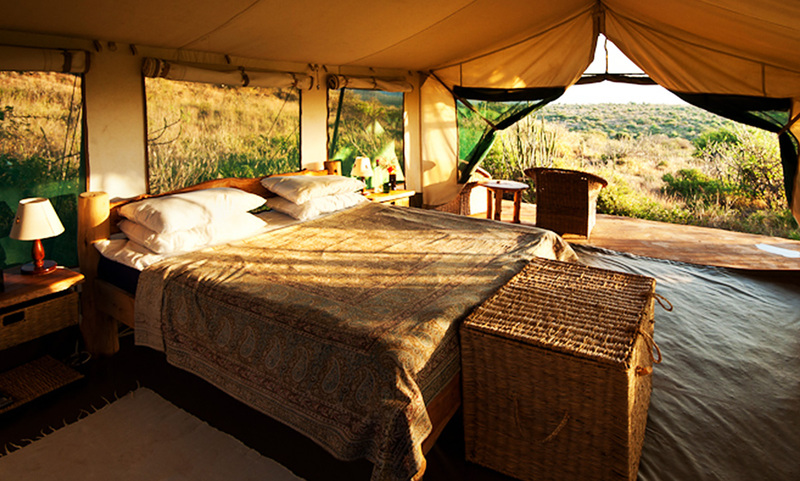 One double tent can have a door set up as a ramp into it and once inside the tent there are no steps to the bathroom. Help into a safari vehicle can be provided and there is no reason why those physically challenged cannot enjoy this beautiful area with the help of our warm team of staff. 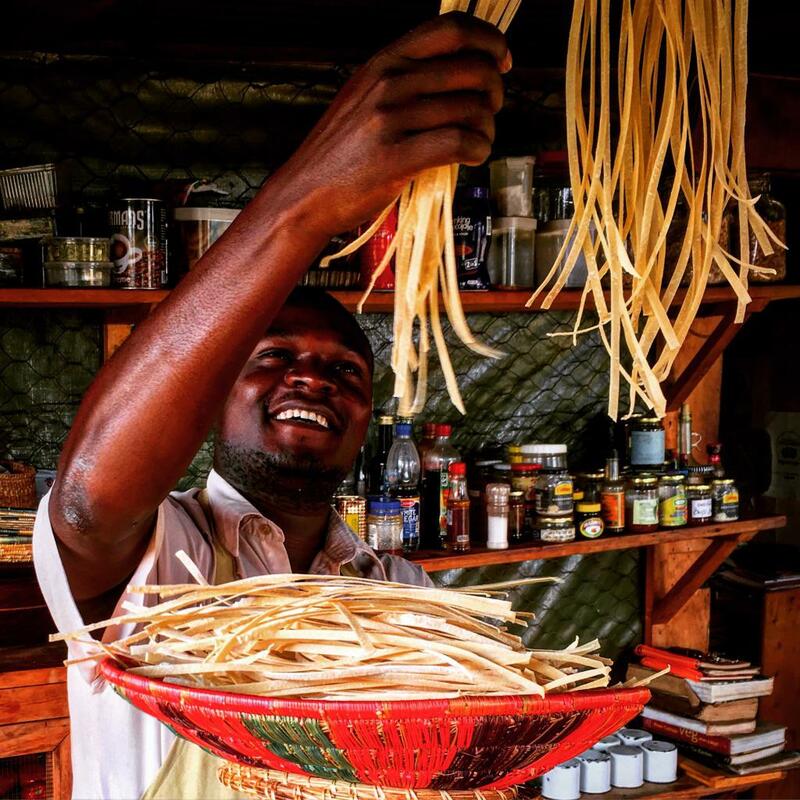 We have a passion for food as well as adventure and all our chefs are home trained. Our facilities are very simple, a wheelbarrow for an oven, a charcoal oven for cooking breads, cakes and pizzas, and a small kitchen for preparing the food. 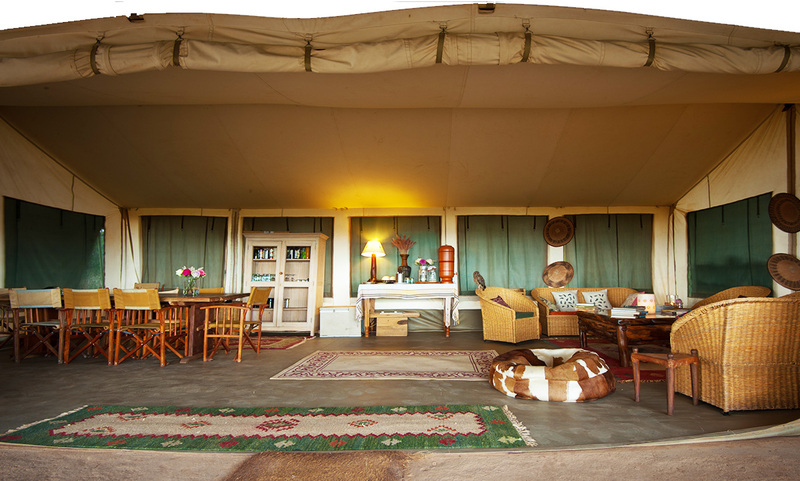 But out of this little establishment comes some of the best food on safari in Kenya. Fresh pasta, a huge range of healthy salads using our own herbs and leaves from the garden, fresh fruit locally grown and meat sourced from the local area, some from neighbouring farms. We hate plastic and minimize what plastic we buy, preferring to make sauces where we can. Good food on holiday is very important and we are extremely proud of what emerges from this little set-up and look forward to showing our guests around the kitchen. Children’s food is simple and we are experts in producing things that they will actually eat having raised our own children in the camp. See more details in the Family Safaris page. We cater for many dietary requirements including gluten-free, vegetarian, vegan, diabetic and allergies. The tents have 240v solar power, and there is a charging station in the main reception tent for cameras and other devices. There is access to a fridge for guests with medication. Solar power does not work well with hair dryers but we have plenty of warm breezes..